Resurfacing concrete is an efficient way to salvage deteriorating concrete without tearing out old concrete slabs. It’s a great way to add value to existing home properties and improve the aesthetic appeal of the exterior and interior spaces of enterprise buildings. Concrete resurfacing systems and concrete overlay systems are used in driveways, patios, pool decks, auto shops, and many more locations. As part of our decorative concrete overlay systems, we offer stamped overlays in a variety of different stone patterns to fit our customer’s unique project requirements and aesthetic preference. Stamped overlays are a cost-efficient way to improve the curb appeal of a home,without having to replace or tear out existing concrete slabs.They can be stained to a desired color and our experts will ensure a long-lasting, weather-resistant application. 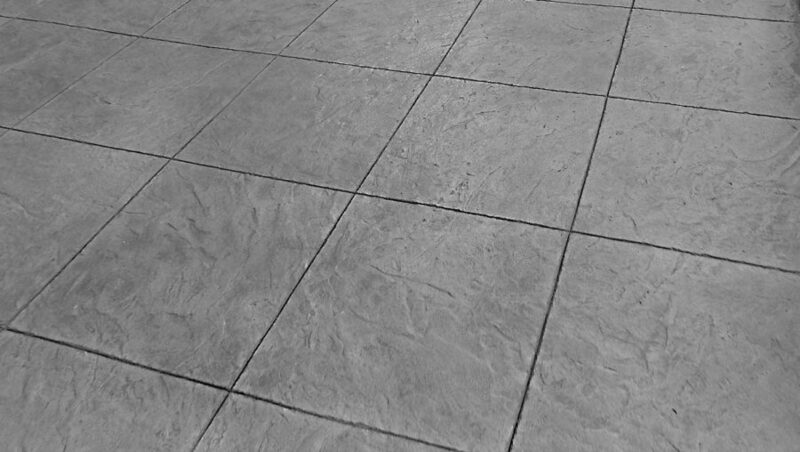 The decorative concrete technique gives the appearance of realistical stone tiles. Stamped overlay systems are especially popular in driveways and patios, and landscaping projects seeking to obtain a high-end appearance. Though there are many do-it-yourself solutions readily available, an insufficient knowledge-base of working temperature conditions such as high heat may unexpectedly influence curing time and produce less than desirable results. Because concrete resurfacing systems are oftentimes applied outdoors in fluctuating conditions, it’s important to hire professionals that understand the specific needs of a customer’s project to apply the proper sealants and assure long-lasting application. Prepping existing concrete for resurfacing begins with cleaning with a high pressure washer to remove dirt so that the adhesion coat can be applied. Large cracks are also repaired to ensure a smooth application. After applying an initial acid wash the concrete overlay is applied.We also offer several overlay textures that we create by hand. Hand troweled texture application can be manipulated to create different levels of smoothness. Knockdown texture, is another raised texture option that will provide slightly cooler temperatures in the hot summers. The texture is “knocked down” after initial application and will leave small troughs and grooves that decrease the surface that barefeet will come in contact with. Orange peel is another raised texture that can be used in poolside decks to due its tendency to be cooler to walk on when compared to concrete, brick or pavers. Unlike knockdown texture, the orange peel will cure in an “orange peel” texture as suggested by its name. Nonetheless we ensure to scrape orange peel and remove burs for smooth walking surfaces. Our customers will oftentimes choose microtopping overlays to resurface old concrete in interior spaces. Microtopping overlay application is our thinnest resurfacing option that gives concrete floors a smooth texture. We use high-strength polymer cement which can not only be used for concrete, but can also be applied to wood and steel.